When Evelin Balbuena-Galvez was six weeks pregnant as a sophomore in Leuzinger High School in Lawndale, she slipped and fell in the shower, missing a day of school. On other days, morning sickness and doctor’s appointments kept her from attending classes. Then, when she was seven months pregnant, she fell down a stairway at school. Concerned for her daughter’s safety, Evelin’s mother kept her home from school for a week. Not long after, the school district tried to fine Evelin’s mom up to $500 because Evelin had too many unexcused absences. Things got even worse for Balbuena-Galvez after her baby boy, Antonio, was born that winter. 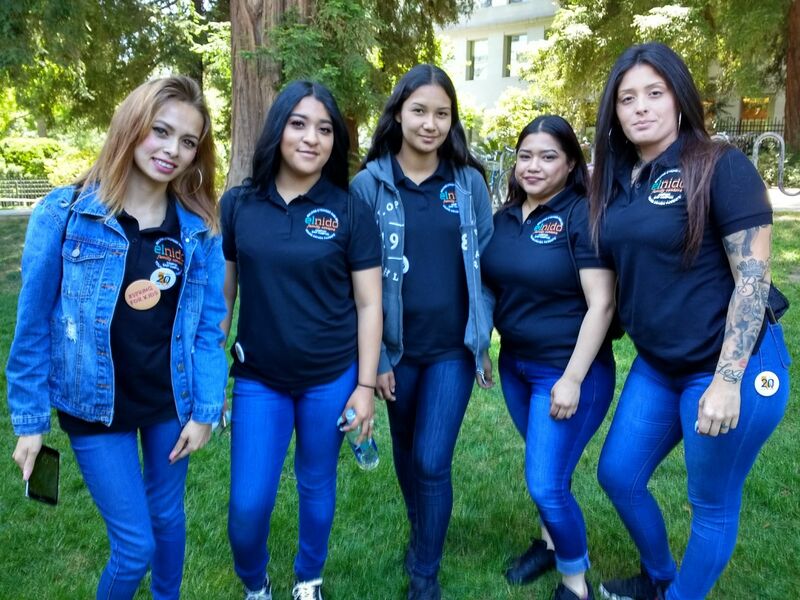 Instead of bearing her burden silently, Balbuena-Galvez joined four other young mothers on a journey in advocacy that led to Sacramento earlier this month to ask lawmakers to support Assembly Bill 2289, the Young Parents’ Right to Education. Authored by Assemblymember Shirley Weber (D-San Diego), the bill would allow pregnant or parenting pupils to receive between six to eight weeks of parental leave — and a parenting pupil not giving birth to receive four weeks of parental leave — in order for them to care for and bond with an infant within the year after birth. During this leave, a pregnant or parenting pupil would not be required to complete academic work or other school requirements. Upon returning to school, the pupil would be entitled to make up work missed and remain enrolled in their school for a fifth year, if needed, in order to graduate. The voyage into advocacy began with a Building Stronger Families (BSF) grant by First 5 LA to El Nido Family Services as part of their work with the Best Start Compton-East Compton Community Partnership. According to BSF Compton Program Manager Saul Figueroa of El Nido, several young parents in the partnership were trained to select and advocate for systems change on an issue affecting young parents in the community. 30 percent of teenage girls who drop out of high school cite pregnancy or parenthood as a primary reason. The highest birthrate among females ages 15–19 years old in 2016 in Los Angeles County is in South Los Angeles, where Compton is located. With six months of advocacy training under their belt from Dawn C. Franks, executive director of Stewards for Healthy Communities and Families, Balbuena-Galvez joined Figueroa on the trip to Sacramento with four other young mothers: Ashley Gijalva, Jennifer Rodriguez, Leti Calleros and Josephine Gonzalez. To these young moms, supporting AB 2289 wasn’t about helping themselves. They had already given birth while attending school. It was about helping others. “This bill would really help other teen parents, stressing about school, the absences, the work,” Balbuena-Galvez said. “It was important to me (to advocate for AB 2289) because if my daughter goes through the same thing I did, she won’t have to suffer like I did and still do,” Gonzalez said. 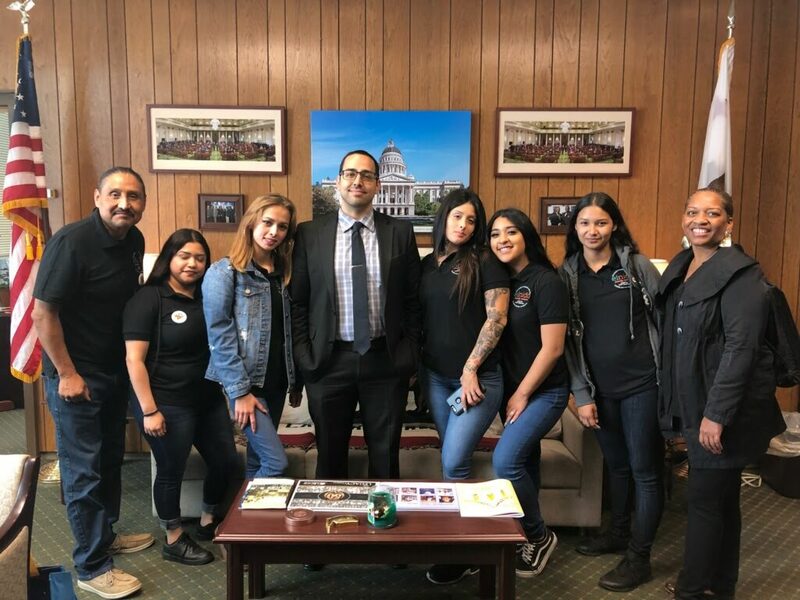 Their first stop in the state capitol was with Assemblymember Weber’s office, where they received packets on AB 2289 to garner support for the bill from other lawmakers. Then they put their advocacy training to the test in meetings with legislative staffers from the offices of Assemblymember Rob Bonta (D-Oakland), Assemblyman Frank Bigelow (R-O’Neals), Assemblymember Ian Calderon (D-Whittier), Assemblymember Richard Bloom (D-Santa Monica), Assemblymember Susan Talamantes Eggman (D-Stockton), Assemblymember Laura Friedman (D-Glendale), Assemblymember Lorena Gonzalez Fletcher (D-San Diego) Assemblymember Vince Fong (R-Bakersfield). In each meeting, the quintet of mothers shared their own stories of high school pregnancy and how AB 2289 would have made a positive impact on their lives. The stories were powerful, drawing tears among the young women and even one legislative staffer. “They were all pretty positive about the bill,” Franks added. While time will tell whether the Assemblymembers will vote for the bill, the trip to Sacramento was clearly time well spent. The young mothers also left an impression on First 5 LA. This includes those who have worked with Best Start in the Communities department to the policy leaders and Commissioners who were in Sacramento on the same day as part of the First 5 Association’s Advocacy Day (see related story here). “This is part of what Best Start partnerships wanted to do: to change the trajectory of what is going on in the community and make it better,” said First 5 LA Commissioner Romalis Taylor, a former Best Start Compton-East Compton partnership leader. First 5 LA is supporting AB 2289 as part of its 2018 Legislative Agenda. “Ultimately, this is what Best Start is about: empowering parents and communities to advocate for themselves, other parents and, most importantly, the infants and young children of Los Angeles County,” said Joaquín Calderón, senior program officer with First 5 LA’s Communities Department. Without First 5 LA’s funding for the BSF program in Best Start Compton-East Compton — which included the advocacy training and the trip to Sacramento — the young mothers would never have traveled to the state capitol. And she’s just getting started: Evelyn Balbuena-Galvez graduates from Leuzinger High School next month.